The Mercury Theatre is situated at Balkerne Gate Colchester, and was opened on May the 10th 1972. The Theatre was designed by Norman Downie, and constructed with money raised by public donation and fund raising, plus a large grant from the Borough Council. The Theatre serves a large area of East Anglia, some 130,000 people. The Theatre is a modern partially glass building featuring two auditoria, a Main House seating 499 people, and a Studio Theatre holding 80 people. It has it's own workshops to construct scenery, costumes, and props, and mounts it's own productions for Colchester, as well as touring nationally. The Main auditorium has a proscenium stage, which is an unusual shape behind the proscenium arch as its slotted into the building's octagonal shape. The stage has a thrusting apron stage and has seating facing the stage, and also on each side of the apron. This apron also has an orchestra pit below it for 10 musicians. The Studio Theatre is a free space, adaptable for various acting and seating positions. The Theatre was born from the Colchester Repertory Company which was formed by Robert Digby and Beatrice Radley in 1937 and first performed weekly productions in the Albert Hall in the High Street. This continued until 1963 with the arrival of David Forder as Manager. The company then gained a considerable stature. In 1968 the Colchester New Theatre Trust was formed to seek a suitable site for a new Theatre. The Theatre's first Artistic Director was David Buxton who was later succeeded in 1984 by Michael Winter. Upon David Forder's retirement as Administrative Director in the late 1990's Michael Winter became the new Artistic Director and Chief Executive. In 1994 Pat Trueman succeeded him in this role until 1998, when Adrian Stokes joined as Associate Director, initiating the Community Education Programme. In 1998 Dee Evans became Chief Executive with Gregory Floy as Artistic Producer. In 1999 they formed the Mercury Theatre Company with Gregory as the Artistic Director, until 2003, when Gregory left, Dee then became both Chief Executive and Artistic Director. In 2012 a new leadership took over with Daviel Buckroyd appointed as Artistic Director. The Stage dimensions of the Main House are:- Depth 12.1 metres with a width of 12.3 metres at its widest part. The Proscenium is 10.7 metres wide and 5.73 high. There is no rake to the stage. The Theatre has a diverse programme with Community Education partnerships, offering 'In House' productions of plays, musicals, and an annual Pantomime, together with touring productions. Thus the Mercury Theatre offers the public of Colchester and surrounding area top quality theatre, renowned both locally and nationally. You may like to visit the Mercury Theatre's own website here. The above article on the Mercury Theatre was written for this site by David Garratt in August 2015. The Hippodrome Theatre stands at 131 High Street, Colchester, Essex, and was built in 1905 by local architect J. W. Start, possibly with Ben Kirk and with Paul Hoffman as consultants. Originally called the Grand Theatre of Varieties, it was owned by Mr Lang Sims, and opened on the evening of Monday April 24th 1905, with a Variety programme. The Theatre was built on the site of the old Lamb Inn which was demolished in 1903. The Essex County Chronicle of Friday 21st April 1905 reported that on the previous Wednesday, the 19th April 1905, a special meeting was held by the Town Council presided over by the Mayor, when a stage play licence was granted for the new Grand Theatre in High Street. The Theatre building is 22.85 metres by 48.75 metres (75 feet by 160 feet). The exterior frontage is of red brick with stone and stucco dressings, in the style of Edwardian Baroque. The frontage being three stories high with a cartouche at attic level in a rounded pediment, with the words 'Grand Theatre' carved therein. The Theatre has an intimate auditorium with two well curved balconies, richly decorated in ornate plasterwork. The first being the Dress Circle with nine rows of seats and the second upper balcony, the Gallery level, has ten rows of seats. The balconies are partly supported on slender cast iron columns. At each side of the proscenium arch are four bow fronted boxes with arched openings. The Proscenium is rectangular in shape, featuring richly decorated foliated plasterwork. Over the top of the proscenium is a large cartouche supported each side by reclining female figures, from which fans out a remarkable auditorium ceiling in the shape of a giant sea shell, radiating outwards and upwards overhead. This was possibly the work of Hoffmann of Vienna. In fact the auditorium design has the feeling very much of being in the style of a Frank Matcham, although it is, as far as we know, not by him. The original seating capacity was listed as 1,700, although by 1912 it is listed as being 1,500. Today, if it was used as a Theatre again it would probably be around 900. The stage, which is raked, has a width of 15.23 metres (50 feet), and 12.19 metres deep (40feet). The Proscenium opening width is 7.77 metres (25 foot 6 inches). Height to the grid is 15.23 meters (50 feet). In 1908 the owner / management of the Theatre had changed and was now in the hands of Messrs Frederick Mouillot and Walter de Frece. By 1912 this had changed again and the owner / management was now in the hands of the Co-Operative Varieties Ltd. Films had always been part of the Variety programmes, but by 1920 the Theatre was acquired by the Bicolour Picture Theatres chain and became a full time cinema. The Bicolour chain of cinemas were themselves taken over by the Gaumont British Theatres circuit in 1926 and the Hippodrome was then run by them. In 1951 the Hippodrome's next owners were Circuits Management Association who still operated it as a cinema. The Hippodrome eventually passed into the hands of the Rank organisation, who ran it as a cinema until 1961 when they closed it and converted it into a Top Rank Bingo Club. The Hippodrome, in this guise, lasted for a further 24 years, when its next metamorphosis was as a short lived retail outlet, before becoming a disco night club. Now known as 'Liquid Envy'. The Hippodrome is a Grade II Listed Building, a fine example of an Edwardian Theatre, a 'sleeping beauty,' still capable of being able to be converted back to a Theatre perhaps one day. The Boxes and Balconies, together with the stage, are still all there, kept in good condition, with almost all of the original ornate plasterwork still in situe. It would make a fine addition to the Town's cultural entertainment, as it's large enough to house Opera, Ballet, Musicals and touring Plays which Colchester cannot now stage in the much smaller Mercury Theatre. The above article was written for this site by David Garratt in April 2015. There had been plays presented in Colchester in a temporary building which was situated behind the Moot Hall from the early days. In the 17th Century The Norwich Company of Comedians visited regularly for many years. However, in the early 19th century a new grand Theatre was built in Queen Street and named the 'Theatre Royal'. It is reputed to have catered for 1,200 people and possessed a large 40 foot stage with a grandiose Proscenium. Right - A Poster for a production of the pantomime 'Cinderella' at the Theatre Royal, Colchester in February 1915 - Courtesy Greg Fox. There is an early advert which appeared in the Ipswich Journal on the 14th April 1802 (perhaps this was for the new Theatre Royal) which reads ' THEATRE COLCHESTER. The public are respectfully informed that the above Theatre will open the beginning of next week. MONS.ST.CLAIR, just arrived from the Continent, will present his astonishing Exhibition of Optical Illusions, called the PHANTASMAGORIA or SUPERNATURAL APPEARANCES, which has been exhibited in London, Paris, &c with unbounded applause. The above exhibitions will introduce the phantoms or apparitions of the dead or absent, in a way more completely illusive than has ever been offered to the eye in a public theatre, as the objects freely originate in the air, and unfold themselves under various forms and sizes, such as imagination alone has hitherto painted them; occasionally assuming the figure and most perfect resemblance of the Hero's and other distinguished characters of past and present times. This Spectrology which professes to expose the practices of artful imposters and pretend exorcists, and to open the eyes of those who still foster an absurd belief in ghosts or disembodied spirits, will, it is presumed, afford also to the spectator an interesting and pleasing entertainment: and in order to render these apparitions more interesting, they will be introduced during the progress of A TREMENDOUS THUNDER STORM, Accompanied with Vivid Lightning, Hail, Wind, &c. in addition to which will be added SOME MECHANICAL PIECES Of ART and MACHINERY. The theatre has been fitted up expressly for the purpose, in such a manner, as to render it at once commodious and agreeable to the public. Places for the Boxes may be taken at the theatre every day from 11 to 2. Boxes + Doors to open at 7.0'clock, the commencement at 8.'' - Ipswich Journal on the 14th April 1802. An Astronomical lecture was presented with the assistance of an 'Eidouranion' or large transparent Orrerry. Crocketts famous horses appeared as did Poole's Myrioma. The Theatre's boards were trod by famous actors and actresses of the day such as:- Macready and Kean. Further records about this Theatre are sketchy until an announcement in the ERA newspaper, dated the 1st August 1889, reports that:- ''The Colchester Theatre is now undergoing extensive alterations and improvements from the plans of Mr Frank Matcham. An enlarged stage is being erected, and a new scene dock and paint room are being added. The dressing-rooms will be much improved and fitted with every convenience. Important alterations in the auditorium are being made, and an entirely new ceiling, handsome proscenium, and private boxes are being added. The old pit will be transformed into stalls, and will, with the dress circle, be fitted with tip-up chairs and upholstered in velvet. The auditorium is to be entirely redecorated from the architect's designs, and a new sunlight will be substituted for the old gas brackets. New scenery and a new act drop are being painted by Mr Richard Douglas. Mr Thomas Thorne's company in 'Joseph's Sweetheart' will appear on the opening night, about the end of September, with Mr Thomas Thorne in his original character of Parson Adams.'' - The ERA 1st August 1889. A more detailed report was printed in the ERA newspaper on the 28th September 1889. 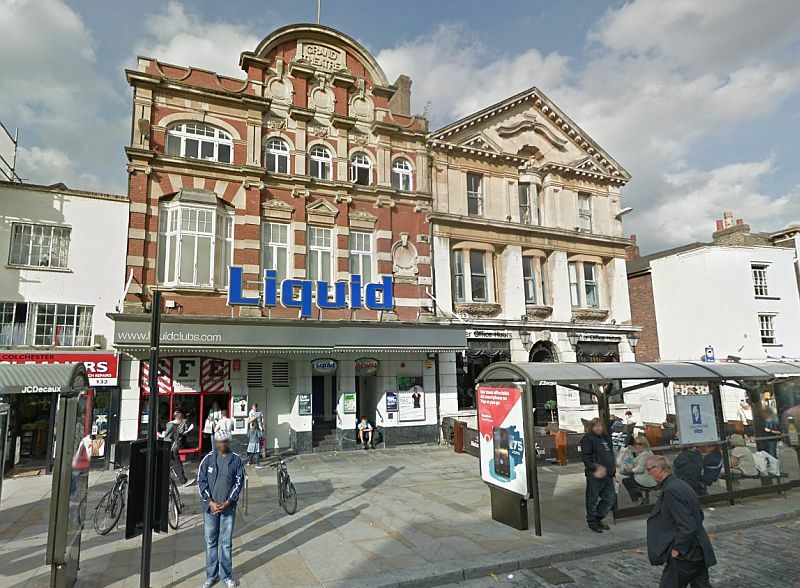 This stated that a new company had taken over the Theatre and carried out the structural alteration for the comfort of Colchester's playgoers. The Auditorium decoration was 'decorative and beautiful in a most chaste and tasteful manner' The colour scheme being terra cotta, old gold, and duck egg green. The Pit was now the stalls area 'the Pitties' being raised to a higher level, and a new staircase connected the upper boxes with what was the old pit entrance. At the foot of the entrance to the Dress Circle, the former lumber store had now been transformed into a refreshment salon together with cloakrooms. At the rear of the Dress Circle a series of arches had been formed with a large Mayor's box, and the Circle was supported on Pillars painted bronze. Both the Stalls and Dress Circle were fitted with Tip-up chairs covered in Crimson velvet. The entrances to the stalls and Dress circle were draped with curtains of terra-cotta and green. The design which ornamented the front of the gallery was continued across the front of the Proscenium and below this was a 'most charming little design in green and gold'. Each side of the Proscenium had an ornamental piece of scroll work with a recess, the background of which was coloured terra-cotta, containing a relief in the shape of an ornamental vase, and overhanging each of these recess's was an ornamental pendant. The Proscenium modelling was carried out by the Plastique company to Matcham's designs. The fronts of the gallery, boxes, and lower circle were all in panel and scroll work with blue plush top edges. The ceiling was divided into two panels containing a 'beautiful design' to each side of which were a large number of hand painted and embossed panels in the form of a mosaic. In the Ceiling centre was a large Sunlight. In the corridors and entrances tastefully arranged framed photographs, both portraiture, land, and seascape were by Mr W.Gill, of Sir Isaac's Walk. The large stage had a new scenery dock and dressing room accommodation and was fitted with rows of fire buckets, together with hydrants for safety, and all gas burners were covered. New scenery had been painted together with a new Act Drop depicting the Gulf of Salerno by Mr Richard Douglas of London. The orchestra was under the direction of Mr Sidney Davies. Ample entrances and Exits were provide both in front of house, and behind the stage. The opening production at the new Theatre Royal on Friday the 20th of September 1889, and for the first two nights, was the play 'Joseph's Sweetheart', a comedy drama based on Joseph Andrews' famous novel and presented by the London Vaudeville Company. The play was presented in 5 Acts in 7 scenes, the illuminated night scene in 'Ranelagh Gardens' being especially effective. The cast was as follows: Mr Thomas Thorne played Parson Adams, Mr Frank Gillimore played Joseph Andrews, Mr Cyril Maude played Lord Fellamar, Mr C. Harbury played Sir George Wilson, Mr J.S.Blythe played the Gipsy, and Mr Stanley Hope appeared as Squire Booby. The ladies of the company were, Miss Ella Banister as Fanny Goodwill, Miss Sylvia Hodgson as Mrs Slipslop, Miss Gladys Ffolliott as Lady Booby, and Miss Coralie Owen as Parson Adams wife. After the opening performance had taken place an assembly sat down to a meal on stage given by the chairman of the company. Mr R. Curzon. Those present were the Mayor and Mayoress, Mr Clark Managing Director of the Theatre, Mr & Mrs E.J.Sanders, General and Mrs Buchanan, Mr & Miss Paxman, Mr Thomas Thorne, Mr Fred Thorne, and members of the company. There was also Mr Alport and a large number of the officers of the Garrison. On Monday there were the first of 4 grand concerts featuring Mr William Ganz, Madame Belle Cole, Mr Lawrence Kellie, Mdle Douilly, Mr Barrington Foote, and Miss Marie Douglas. On Wednesday an amateur performance of Tom Taylor and Charles Read's comedy 'Masks and Faces' was performed in aid of the Soldier Institute. The Theatre continued to present a varied programme throughout the next few years with visits by Edward Terry, Martin Harvey and his company, Mrs Patrick Campbell, and Gladys Cooper. In September 1918 a fire broke out and, despite valiant efforts to quell the flames, within a few hours, nothing of the Theatre was left save the side walls. A sad end to a Theatre which in various forms had presented entertainment to the Colchester public since the early nineteenth century. Today the Theatre's site is a repair depot for Firstbus and will shortly be replaced by an indoor market as part of the planned cultural quarter. The above article was written for this site by David Garratt in June 2015. The Playhouse Theatre is situated on a corner site at the junction of St John's Street, and Chapel Street North in Colchester. It was built in 1929 and designed by the architect John Fairweather for the Owner/Management of the Bostock Circuit. It was originally built as a Garrison Theatre. The exterior is of red brick, three storeys high, and designed in the Art Deco style, giving a solid square impression. It has a grand entrance flanked each side with stone/stucco work. Above the central entrance is a large window with a decorative top, with more plain windows to either side and above on the third storey. Originally built as a three tier Theatre, consisting of Stalls, Dress Circle, and Gallery. It has a square plain proscenium, 10 metres (32 feet 3 inches) wide, with a slightly fluted cove moulding, flanked each side by a stage box at dress circle level which seem to face more into the auditorium than having a view of the stage. Originally it had an orchestra pit for 12 musicians. The dress circle front has moulded plasterwork in the design of moulded wreathed medallions and anthemion ornaments. The ceiling of the auditorium is square with a circular dome design in the centre, with panels in each corner of the remaining square ceiling. The stage is large and the Theatre has nine dressing rooms. The original seating capacity was 1,150 seats. The Playhouse Theatre opened on the 18th March 1929 with a production of 'So This Is Love' from London's Winter Garden Theatre. It was short lived as a Theatre operating a weekly change of programme until September 1930, when it was taken over by the Federated Estates Circuit and converted to a cinema. On the 2nd of May 1932 it was taken over by the Associated British Cinema chain (ABC). In 1935 large scale alterations were made to the building's auditorium. The top tier, the Gallery, was completely removed, and the existing dress circle made much larger and re-seated. The cinema reopened on the 6th April 1935, now having a seating capacity of 1,158 seats. The Cinema closed in March 1962 and a modernisation plan was put into practice by C. J. Foster, which reduced the seating capacity down to 963 seats, opening as the ABC on the 20th October 1962. The ABC Cinema closed it's doors on the 1st August 1981 and was converted to a Coral Bingo Club, later to be a Gala Bingo Club. This eventually closed in 1993 when Gala moved out into a purpose built building nearby. 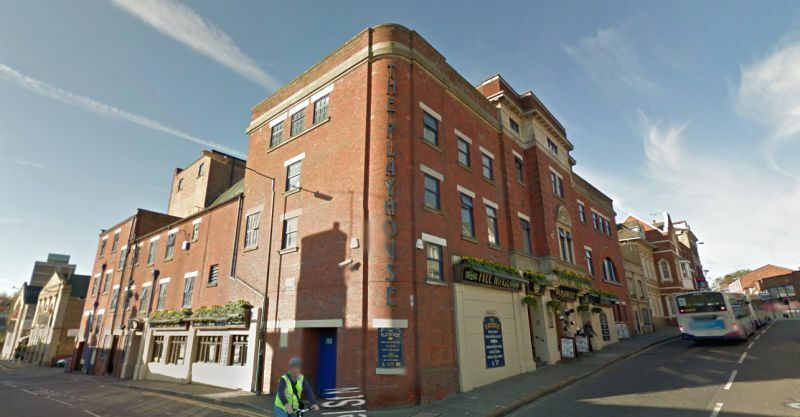 The Theatre then stood empty and derelict until J. D. Wetherspoon bought the Theatre, employing Ferraby & Taylor to convert it into 'The Playhouse' pub, as part of their chain of public houses. Reopening on the 18th December 1994. You may like to visit the Playhouse Pub's own website here. The conversion was very sympathetically done retaining the Theatre atmosphere. The stalls area is now a flat floor with tables and chairs. A large bar area was created underneath the Dress Circle in the stalls area. The stage is now decorated with a standing stage set as if a play is being presented, with customer tables and chairs on the stage acting area looking out into the auditorium. In the stage boxes, and dress circle are cut outs, and stuffed dummies standing and sitting in the seats looking down at the pub customers below, with Theatre posters decorating some of the auditorium wall space. The Theatre could be converted back for touring theatrical use, but the Hippodrome Theatre would probably be considered first. A Video showing the exterior and interior of the Theatre today can be found here.